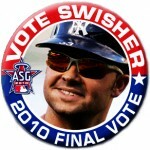 After convincing Robinson Cano to “back” out of the Home Run Derby, the Yankees find themselves in an awkward spot as Major League Baseball has announced that Nick Swisher will essentially be taking his place. Maybe the “Send Swish” to the All Star Game wasn’t such a great idea after all? Although the reason given for Cano’s exit from the contest was a lingering sore lower back, the initial response from Yankees’ coaches and brass was a concern about Cano altering his swing by trying to launch home runs during the derby. Now, with Swisher deciding to take part, Cashman and Girardi could have a tough time explaining to Cano why the derby was bad for him, but ok for Swisher. The team’s communication with their star second baseman, who seemed genuinely excited about the opportunity to take part in the contest, was very poor earlier in the week, so hopefully they broke the news to him before it was reported by baseball (and hopefully Swisher informed the team of his decision before letting baseball know).